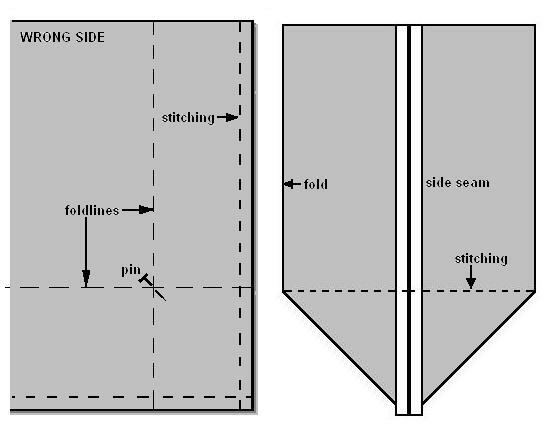 Mitering is the process of seaming or folding a surface diagonally for sharper professional finish. 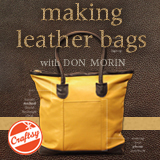 This is a neat way of finishing a corner or gusset end and is less bulky, especially on heavier fabrics. 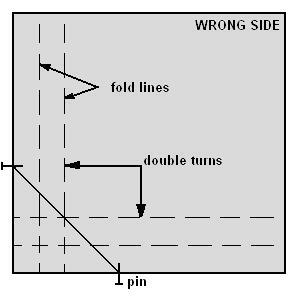 Fold up a single or a double turn, mark with a pin where the top fold will come, and press. Fold in the side turn, mark with a pin where the inside fold will come, and press. Fold in the corner triangle to the pins. Press along the fold. Trim excess fabric to a narrow seam allowance. Turn up a single or a double turn at the lower edge. Turn in the side turn. With face side together, layer body panels aligning edges and stitch up side seams. Press seam open. Mark with a pin where the gusset end fold will come on front and back panels. Fold in the side turn at the pins, where the gusset fold will come. Fold in the corner triangle to the pins. Press along the fold. Stitch across side seam from pin to pin. Trim excess fabric to a narrow seam allowance.